Background: Children growth can be divided into; infancy, toddlers, preschoolers, middle childhood, and adolescence. Child's nutrient needs correlates with changes in growth rates. Daycare, where toddlers and preschoolers spend increasing durations nowadays, might affect children feeding habits and thus their growth. In this study, we measure overweight indicators and growth parameters among toddlers and preschoolers attending daycare. Methods: In a cross sectional analysis, we compared adiposity and anthropometric measures of 83 toddlers and preschoolers attending day care with those of 31 age peers receiving homecare. Results: Weight/height Z score and percentiles showed no significant differences between daycare and homecare children. 18.1% of daycare children and 29% of homecare children had weight/height Z score>+2 and weight/height percentile>95%. Only one child in daycare group (1.2%) and 2 children in homecare group (6.5%) had weight/height Z score<-2. Trunk /extremities ratio was significantly higher in homecare than daycare group (p value<0.001). Conclusion: While daycare does not seem to affect global nutritional status of toddlers and preschoolers, homecare children showed evidences of increased trunkal fat. Child growth, Obesity, Malnutrition, Healthy nutrition. Children development can be divided into four stages; infancy, preschool years, middle childhood years, and adolescence. After birth, an infant loses about 5-10% of his birth weight then his weight doubles the birth weight at age 4-6 months. Between 1 and 2 years old, a toddler gains about 5 pounds and remains at this rate of growth till 5 years old. The child's nutrient needs correlates with these changes in growth rates so that an infant needs more calories in relation to size than a preschooler or school-age child needs. Even though nutrient intake may be different for each child, a healthy child should follow an individual growth curve in order not to shift either towards underweight or overweight . Growth indicators are measures defined by the World Health Organization (WHO) to measure nutritional imbalance, which results in either under-nutrition (underweight, wasting and stunting) or overweight. Child growth and development are essential indicators of nutritional status and health in populations. Children with a low height for age (stunting) represent the cumulative effects of malnutrition and infections since and even before birth. Therefore, stunting indicates poor environmental conditions or long-term restriction of a child's growth potential. On the other hand, overweight (high weight for height) reflects excess nutrition or bad eating habits that lead to severe morbidities during childhood or later in adult life . According to WHO, overweight in toddlers and young children is defined as weight/height Z score>+2 while in adolescence the use of both body mass index (BMI) for age and skinfold for age are the best indicators for assessment of overweight . Unhealthy diet and low levels of physical activity are the most important causes of childhood overweight . Eating and physical activity habits are often formed at young age, and once established, mostly maintained throughout life. Previous research has investigated the influence of the childcare setting on both eating habits and physical activity among children [5,6]. Daycare is a setting in which toddlers and preschoolers today spend much time. This setting could, therefore, have an important role on children growth. We hypothesis that, toddlers and preschoolers receiving home care will have better growth parameters and less chance to develop overweight or underweight than those attending daycares. In our study, we measure overweight indicators and growth parameters among toddlers and preschoolers attending daycare and compare these parameters with those who receive homecare in order to evaluate the effect of type of children care on their growth. Eighty-three toddlers and preschoolers attending daycare and 31 age-peers receiving homecare, constituting a convenient sample, were examined for their growth parameters. Children attending daycare were collected randomly over a period of 4 months (Starting from September 2015 to the end of December 2015) from 4 different daycares representing various urban regions in the province of Almadinah Almounourah, Saudi Arabia while those receiving homecare were age-peers relatives that did not attend any daycare and cared for at home. Inclusion criteria for participants were any healthy child aged above one year and below 5 years, whose parents agreed upon taking anthropometric measures on bare body. A written informed consent was taken from parents or participant’s legal guardians. Daycare group of participants should have joined the daycare for a period of at least 6 months and spent on average 4 h per day in day care. Exclusion criteria were prematurely born children or small or gestational age and any chronic illness. In a comparative cross sectional analysis, anthropometric measurements of both daycare children and homecare children were measured using a balance, a standard stretch resistant measuring tap and a skin fold caliper. BMI, weight/height Z scores and percentiles were calculated using WHO calculator . BMI was defined as the ratio weight (kg)/recumbent length or standing height (m2). Z score was defined as the deviation of an individual's value from the median value of a reference population, divided by the standard deviation of the reference population. Each body measure was taken by the same person (one of the authors) all over the study period on bare children body. Each item was measured twice by the same person, the two measurements should agree within half a centimeter of each other. If not, the same person measured a third measurement and the two closest were recorded [7,8]. For waist circumference, the measuring tap was placed horizontally halfway between the lowest rib and the top of the hip-bone, roughly leveling it with the umbilicus. Then the tape was pulled so that it was snug and did not slide, without indenting the skin, so that one was able to slip his little finger under it comfortably. Hip circumference was measured at the widest point around the buttocks. Skin fold caliper was used to measure skin folds. The caliper was applied 1 cm below and at right angles to the skin pinch at certain locations in the body. Triceps skinfold was measured at the level of the mid-point between the acromial (lateral edge of the acromion process) and the radial (proximal and lateral border of the radius bone), on the mid-line of the posterior surface of the triceps muscle. The arm should be relaxed and supinated. A vertical pinch, parallel to the long axis of the arm, was made at the landmark. Biceps skin fold was measured at the level of the mid-point between the acromial and the radial, on the mid-line of the anterior surface of the arm (over the biceps muscle). The arm should be relaxed and supinated. A vertical pinch, parallel to the long axis of the arm, was made at the landmark. The subscapular skinfold was measured at the lower angle of the scapula. The pinch was made following the natural fold of the skin, approximately on a line running laterally and downwards (at about 45 degrees). Thigh skinfold was measured at the mid-point of the anterior surface of the thigh, midway between patella and inguinal fold. A vertical pinch was taken. This measurement was taken with the subject sitting and the knee bent at right angles. Abdominal skinfold was measured at a mark that made 5 cm adjacent to the umbilicus, to the right side. The vertical pinch was made at the marked site, and the calipers placed just below the pinch, not to place the caliper or fingers inside the navel. Our main exposure was type of childcare either center care (daycare) or homecare. We imputed data of 83 child attending daycare and 31 receiving homecare. Weight/height Z score tables and percentiles, as standard measures of children and infant overweight and obesity according to WHO recommendations, was used . Primary outcome of this study was weight/height Z score. Secondary outcomes were other growth parameters that included; subscapular, triceps and abdominal wall skinfold thickness, trunk/extremities ratio that reflects trunkal obesity and waist/hip ratio which reflects inter-abdominal fat. Other measures included age of initiation of daycare, age of breastfeeding cessation and for those below 24 months, we registered if they were still breastfed or not. All data were expressed as mean ± SD. Normality of data distribution was tested using the Kolmogorov-Smirnov criterion. Primary outcome variable was normally distributed. Analysis of variables was assessed for inter-group comparison using two-tailed t-test. Categorical data were compared using chi-square test. P value<0.05 was considered statistically significant. Post-hoc power analysis indicated an 81.8% chance of detecting a true difference in the primary outcome at an alpha level of 0.05. Data were analyzed using SPSS (version 16). Of 83 children attending daycare, 49 (59%) were males and 22 (26.5 %) were<24 months old; and 31(37.3%) children were receiving homecare, of these 18 (58.1%) were males and 8 (25.8%) were<24 months old. The mean age of initiation of daycare among daycare participants was 10.3 (± 6.8) months. Other study population characteristics are presented in Table 1. Data are presented as number (n) and percent (%) or mean and Standard Deviation (SD). P value is calculated using two tailed t- test or Chi-square test. Table 1. Study population characteristics. There were no significant differences in weight/height Z score or percentiles between the 2 study groups. Fifteen daycare participants (18.1%) had weight/height Z score>+2 and weight /height percentile >95%, of these 11 were boys (of them 6 were<24 months of age) and 4 were girls (of them 1 was<24 months of age), while among homecare participants 9 (29%) had weight/height Z score>+2 and weight/height percentile >95%, of these 6 were boys (of them 4 were<24 months old) and 3 were girls (of them 1 was<24 months of age). Only one participant of the daycare group (1.2%) had weight/height Z score<-2; his weight/height felled on the 7th percentile. He was male and his age<24 months. In the homecare participants group, 2 (6.5%) had weight/height Z score<-2. Both of them were males; one was<24 months of age and had weight/height percentile of 1%, and the other was>24 months of age and had weight/height percentile of 2%. Mean weight/height Z score in girls and boys in both groups of study population is shown in Figure 1. 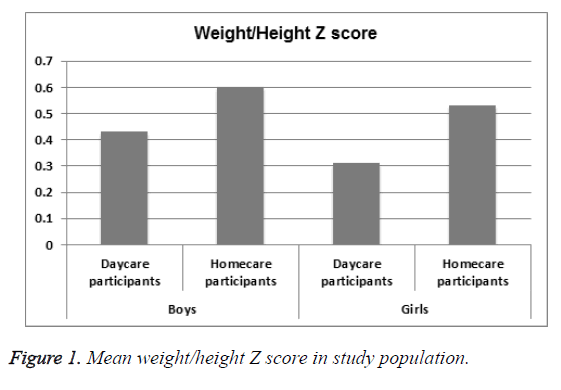 In boys, daycare participants’ weight/height Z score (mean 0.43 (SD ± 0.29)) was insignificantly (p value 0.62) lower than that in homecare participants (mean 0.6, (SD ± 0.24)). Similarly in girls, daycare participants had insignificantly (p value 0.19) lower weight/ height Z score (mean 0.31, (SD ± 0.12)) than that of homecare participants [mean 0.53 (SD ± 0.19)). Figure 1. Mean weight/height Z score in study population. 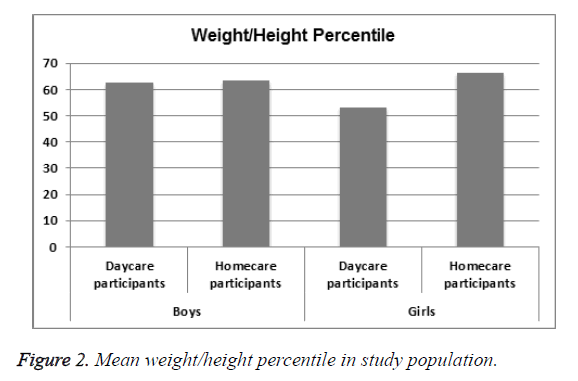 Mean weight/height percentile in girls and boys both in daycare and homecare participants is shown in Figure 2. Among daycare participants, boys weight/height percentile (mean 62.6 (SD ± 30.3) was insignificantly (p value 0.94) lower than that in homecare boys participants (mean 63.2 (SD ± 37.5). Similarly, in daycare participants, girls weight/height percentile (mean 53.2, (SD ± 30.1) was insignificantly (p value 0.21) lower than that in girls homecare participants (mean 66.3 (SD ± 32.9). Figure 2. Mean weight/height percentile in study population. Although we hypothesized that home care for toddlers and preschoolers allows them to have better growth and less incidence of overweight or underweight than those who attend daycare, our study showed that there is no significant difference between mean weight/height Z score and percentile in both daycare or homecare children. There was also no significant difference between number of underweight children or overweight children in both groups of our study (p value=0.12 and 0.2, respectively). These results are in-line with previous studies that reported protective effects of daycare against overweight or obesity [9,10], or found no effect [11,12]. On the contrary, other studies showed that daycare attendance is positively associated with BMI Z scores at 2 years old, and a greater increase in BMI Z score between 1-2 years old [13,14]. In addition, daycare use increases the odds of being overweight at age of 1 year, and developing overweight between the ages of 1 and 2 years [15,16]. These different findings might be explained by the differences in the cultural and genetic background of study populations. As several previous studies included low-educated or low-income populations [9-12]. In our current sample, the majority of the mothers (73%) had a high educational level. Another difference between the study populations is the age of children. All studies of daycare use in young children (<3 years), found a positive relationship between daycare use and overweight [13,14,16]. In contrast, studies among older children (>3 years) showed conflicting results [9-12,16,17]. Possibly, this indicates that daycare is specifically unfavorable for young children. Finally, differences in the overall daycare systems in different studies and countries e.g. different opening hours and different policies, might influence the findings. Other growth parameters like waist, hip circumferences and waist/hip ratio are used to measure intra-abdominal fat in adults and tend to reflect risks for cardiovascular diseases. On the other hand, total body fat can be predicted from skinfold thickness at various anatomical sites of the body, both in children and adolescents . Subscapular skinfold measurement determines trunkal body fat and the triceps skinfold measures fat in the extremities. The clinical validity of skinfold measurement is well established. Triceps skinfold correlates positively with arteriosclerosis index and systolic blood pressure  and negatively with high-density lipoprotein cholesterol . In addition, it is proved that trunk skinfold thicknesses and trunk/extremity skinfold ratio appear to be more important as indicators of intra-abdominal adiposity in children and adolescents than waist/hip ratio . Our results showed that the mean waist/hip ratio, subscapular skinfold and trunk/extremities ratio were significantly higher in homecare than daycare children (p value=0.03,<0.001,<0.001, respectively). These results indicate that homecare children have significant trunkal obesity than daycare children, which agrees with what was previously published about the importance of daycare in prevention of children overweight and obesity . Our study may contribute in supporting this proposition. Previous research has identified modifiable factors in the child-care environment that influence energy balancerelated behaviors, such as staff behavior and availability of facilities [5,6,21,22]. When combining this knowledge with the fact that children are spending increasing amounts of time in day-care [23,24], it may appear that it contributes to counteracting the childhood overweight and obesity. Some factors in daycare sittings may affect its protection against obesity in children. An example of these factors is infectious diseases. Children who attend child-care are more likely to be infected with several communicable diseases . These diseases and the medication taken for them might influence children's weight and/or height. Besides, daycare environment may have differential influences on the different dietary and physical activity behaviors at different ages [26,27]. Generalization of our study findings might be limited by the characteristics of the specific population we studied. The sample was taken from urban daycare facilities and had a high percentage of university-level educated mothers. Level of education affects family behavior as regard children feeding. However, in our view, for this sector of population our study delivers a valid conclusion. The wide range of participants-age and different openings hours for daycares included in the study might affect the sample homogeneity. However, both study groups (daycare and home care) were matched as regard the participants’ age and to ensure homogeneity of daycare group, we included only those who had joined the daycare for a period of at least 6 months and spent on average 4 hours a day. The study might be limited also by the relatively small number of participants. However, a post-hoc power analysis indicated an acceptable study power (81.8%). Lastly, the cross sectional nature of the study limits the ability to foresee the long-term effects of daycare on nutritional status of participating children. In our study we compared daycare attending toddlers and preschoolers to those remaining at home regarding overweight and growth indicators. Homecare children have significantly increased incidence of trunkal body fat while totally there is no significant difference in the prevalence of overweight or underweight in both study population. Stettler N, Bhatia J, Parish A, Stallings VA. Feeding healthy infants, children, and adolescents. In: Kliegman RM, Behrman RE, Jenson HB, Stanton BF, editors. Nelson Textbook of Pediatrics (19th edn.). Saunders Elsevier, Philadelphia, USA 2011.
WHO Multicentre Growth Reference Study Group. WHO Child Growth Standards based on length/height, weight and age. Acta Paediatr Suppl 2006; 450: 76-85. [No authors listed]. Physical status: the use and interpretation of anthropometry. Report of a WHO Expert Committee. World Health Organ Tech Rep Ser 1995; 854: 1-452. Gibson RS. Principles of Nutritional Assessment. Oxford University Press New York 1990. Gubbels JS, Kremers SP, Stafleu A, Dagnelie PC, de Vries NK, Thijs C. Child-care environment and dietary intake of 2- and 3-year-old children. J Hum Nutr Diet 2010; 23: 97-101. Hughes SO, Patrick H, Power TG, Fisher JO, Anderson CB, Nicklas TA. The impact of child-care providers’ feeding on children's food consumption. J Dev Behav Pediatr 2007; 28: 100-107. Slaughter MH, Lohman TG, Boileau RA, Horswill CA, Stillman RJ, Van Loan MD, Bemben DA. Skinfold equations for estimation of body fatness in children and youth. Hum Biol 1988; 60: 709-723. Goran MI, Driscoll P, Johnson R, Nagy TR, Hunter G. Cross calibration of body composition techniques against dual energy X ray absorptiometry in young children. Am J Clin Nutr 1996; 63: 299-305. Frisvold DE, Lumeng JC. Childhood obesity and exposure to head start services. University of Michigan Press; 2007. Lumeng JC, Gannon K, Appugliese D, Cabral HJ, Zuckerman B. Preschool child care and risk of overweight in 6- to 12-year-old children. Int J Obes (Lond) 2005; 29: 60-66. Rapp K, Schick KH, Bode H, Weiland SK. Type of kindergarten and other potential determinants of overweight in pre-school children. Public Health Nutr 2005; 8: 642-649. Kimbro RT, Brooks-Gunn J, McLanahan S. Racial and ethnic differentials in overweight and obesity among 3-year-old children. Am J Public Health 2007; 97: 298-305. Benjamin SE, Rifas-Shiman SL, Taveras EM, Haines J, Finkelstein J, Kleinman K. Early child-care and adiposity at ages 1 and 3 years. Pediatrics 2009; 124: 555-562. Kim J, Peterson KE. Association of infant child-care with infant feeding practices and weight gain among US infants. Arch Pediatr Adolesc Med 2008; 162: 627-633. Maher EJ, Li G, Carter L, Johnson DB. Preschool child care participation and obesity at the start of kindergarten. Pediatrics 2008; 122: 322-330. Gubbels JS, Kremers SP, Stafleu A, Dagnelie PC, de Vries NK, van Buuren S, Thijs C. Child-care use and the association with body mass index and overweight in children from 7 months to 2 years of age. Int J Obes (Lond) 2010; 34: 1480-1486. Wronka I, Pawlinska-Chmara R. Childcare, height and BMI among female Polish university students. Econ Hum Biol 2007; 5: 435-442. Rolland-Cachera MF. Body composition during adolescence: methods, limitations and determinants. Horm Res 1993; 39: 25-40. Power C, Lake JK, Cole TJ. Measurement and long-term health risks of child and adolescent fatness. Int J Obes Relat Metab Disord 1997; 21: 507-526. Fox K, Peters D, Armstrong N, Sharpe P, Bell M. Abdominal fat deposition in 11-year-old children. Int J Obes Relat Metab Disord 1993; 17: 11-16. Bower JK, Hales DP, Tate DF, Rubin DA, Benjamin SE, Ward DS. The childcare environment and children's physical activity. Am J Prev Med 2008; 34: 23-29. Pate RR, McIver K, Dowda M, Brown WH, Addy C. Directly observed physical activity levels in preschool children. J Sch Health 2008; 78: 438-444. Blackburn P. Childcare services in the EU-what future? European Foundation for the Improvement of Living and Working Conditions, 2006. Bradley RH, Vandell DL. Child care and the well-being of children. Arch Pediatr Adolesc Med 2007; 161: 669-676. World Health Organization. Infant and young child feeding: Model chapter for textbooks for medical students and allied health professionals. World Health Organization: Geneva, Switzerland; 2009. Davis KF, Parker KP, Montgomery GL. Sleep in infants and young children: Part one: normal sleep. J Pediatr Health Care 2004; 18: 65-71.